Here is a rare glimpse into a meal I ate as a child. I always said I could never be a Next Food Network Star because I don’t have a vast array of family recipes to whip up. I don’t know why, but I have a really hard time remembering what I ate as a kid. I was really picky, so you’d think it would be easier but there are very few recipes I really remember and those that I do were more from when I was a teenager. I remember burgers and hot dogs on the grill in the summer. Steak was always served with a baked potato and a salad. I used to pick the beans out of chili. A dish with pork chops, rice and apples is vaguely familiar. And that’s about it. I’ve mentioned before I tend to gravitate toward Mexican and Asian dishes since we didn’t eat those. No tacos, no stir fry. I didn’t like boxed mac and cheese or spaghetti for many, many years. I know that we ate a lot of chicken, however this is the only dish I can really remember. I can still see it cooking on the stove, in this large old black skillet that my mom most likely still has, bubbling away. 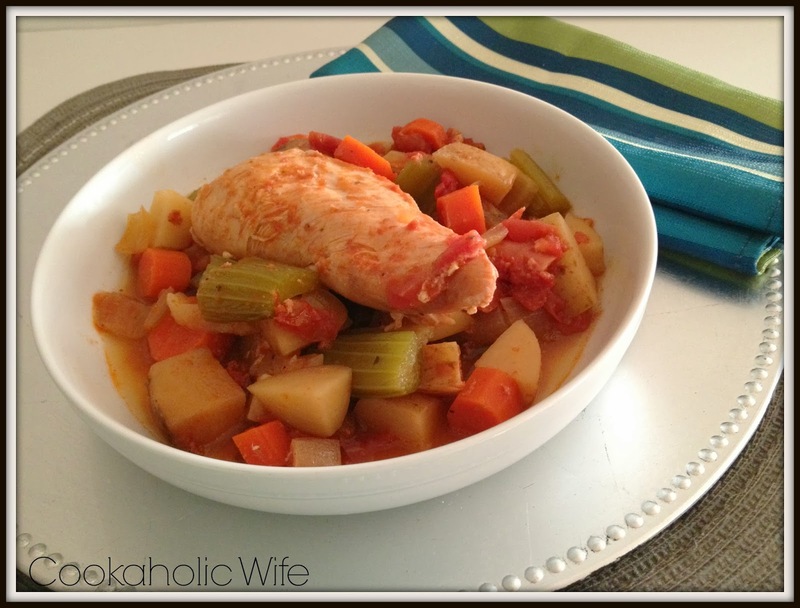 This isn’t the exact recipe since I opted to make it in the crock pot, but it’s pretty close. 1. Combine all of the ingredients together in a 6 quart slow cooker. Cook on low heat for 6-8 hours or until chicken falls off the bone. 2. Discard bones and serve hot. If you wanted to make this on the stove top, I believe my mom might have also used some tomato sauce instead of water since her broth was thicker than mine turned out. To make this a freezer meal: combine all ingredients except for potatoes into a sealable bag. Freeze for up to 3 months. 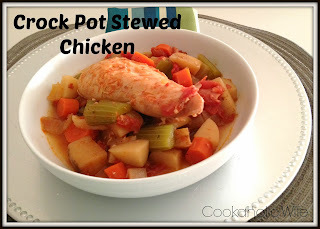 To cook, thaw in the fridge overnight, then add to the crock pot with potatoes. Same cooking time and temperatures.